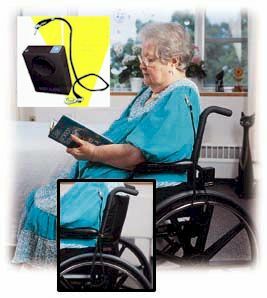 Bed / Chair Alarm; Elderly, Physically Impaired, Arthritis Sufferers. Another, more portable way to keep track of patients is this Bed / Chair Alarm. Currently being used in many care facilities throughout the United States the Patient Alarm is an effective and low-cost alarm for the safety of Alzheimer's patients; a great way to prevent wandering and slip & fall incidents. The Patient Alarm is the result of listening to the needs of long-term care professionals. Our packaging includes compact alarm (about the size of a pager) that sounds loud siren, 2 cords that when connected together can extend up to 34" with clip and pull pin, mounting with two sided Velcro for strapping on to railings, straps that keep the alarm firmly in mounting unit, built in flashlight and complete instructions. While there are other similar devices available we have found that it is very difficult to pull the pin out of those units thus making it possible that the alarm itself can cause a slip and fall.. Ours is triggered (the pin comes out) much easier.